The standard Cutless Bearing on an Alberg 30 is 1 3/8" O.D. X 7/8" I.D. The Buck Algonquin name is Barracuda. This will change, of course, if you've changed to a 1" shaft. 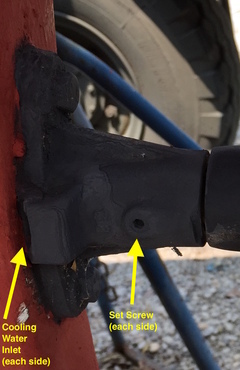 To replace the cutless bearing, remove the two bolts holding the cast cutless bearing housing to the hull, and unscrew the casting from the stern tube. Many people get into trouble by trying to pry it off, but it's threaded onto the stern tube which should remain in the hull. If it's hard to turn, heat the flange of the housing with a propane torch to soften the caulk sealing out the water. There are two set screws that hold the cutless bearing in. Remove these set screws and press the cutless bearing out of the housing. Press in the new one and replace the set screws. When reinstalling the cutless bearing housing, caulk the flange and bolts well. It is these surfaces that keep the water out of the boat. I like to use 3M 5200 for this because of its adhesive power. You can always heat the flange to soften the caulk when removing it. Note: Rick Leach has through-bolted his stern tube casting, but that seems an unusual approach.